We supply high quality Hydrogen Gas which is used in chemical synthesis to produce ammonia, methanol and other products. Our Hydrogen Gas is used in hydrogenation of edible oils and petroleum products. It is mixed with air to formulate fuel gas for FID gas chromatography and sometimes works as a carrier gas too. Its other uses are annealing or softening of metals and heat treating of metals. Available with us is Flammable Hydrogen Gas, which is found only in ambient temperatures and atmospheric pressures. This gas is colorless, odorless, tasteless, flammable, and non-toxic, and has numerous applications in diverse fields. This product is shipped in gaseous state, to application areas such as refineries and petrochemical companies for hydro treating, catalytic reforming & hydro cracking. 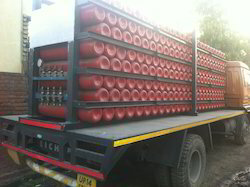 Hydrogen is also used in metal production, welding, lasers, plastics, food production and semiconductors.Also available in fix trolla of 152 cyls to 285 cylinders mounted on truck.